Calm. Stillness. Tranquility. These words are not part of the vernacular for most American University students. Whether it is jetting to class or running to an internship on Capitol Hill, the concept of mindfulness is in direct contrast to the busy nature of the typical AU student. This hustle and bustle can lead to negative consequences for students. A lot of AU students feel fatigue, stress, and exhaustion from going to class, work, internship, studying, and personal trials and tribulations. The group Mindful Eagles wants to change those negative outcomes by offering basic mindfulness and meditation meetings for AU students. 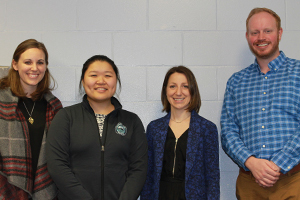 The program's co-facilitators, Jennifer Baron Knowles, Colin Gerker and Marianne Norman, host meetings every Tuesday at 3 p.m. in the Kay Spiritual Life Center lounge. "It is for students finding a peaceful space to reduce stress and find joy," Knowles said. Each session starts with the definition of mindfulness: Paying attention — On Purpose. In the present moment. Without judgement. Students are then asked to set aside distractions and start with a one word check-in on how they are feeling that week. "We ask students to put their cellphones away and turn them off to not be distracted," Knowles, the Assistant Director of Kay Spiritual Life Center, said. "We find that students do not miss their cellphones after participating in a session." Then the group moves into a breathing activity, focusing on each breath they take. The purpose of this activity is to bring students into the present moment by clearing their minds of whatever else they may be thinking about. After the activity, the group explores the topic of the session, such as mindful yoga, walking meditation, and positive self-talk. From left to right, Knowles, Tan, Norman, Gerker. For the students who attend Mindful Eagles sessions, the results have been overwhelmingly positive. Students noted an improved mood, lowered anxiety, and increased self-compassion as benefits of their participation in the program. “It was a good place to come and re-center myself. I don’t have to be stressed all the time like I was that first semester. Mindful Eagles made me realize that things will be okay and I can pay attention to little things that make me happy. And little by little, life becomes easier,” Tam explained. Students realizing the power in their actions is a goal of the program. “It is important for students to understand that the classes we take, the assignments we work on, the student organizations we join and lead is all done as a choice. Framing it as a choice gives power over the work you are doing,” Knowles said. Taking a pause in any situation is a key to achieving mindfulness according to Knowles. Mindful Eagles teaches students the benefit of not just going into a reaction, but pausing, and then offering a response. 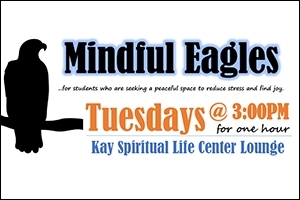 Take a much-needed pause in your busy week and join Mindful Eagles every Tuesday at 3 p.m. in the Kay Spiritual Life Center Lounge.